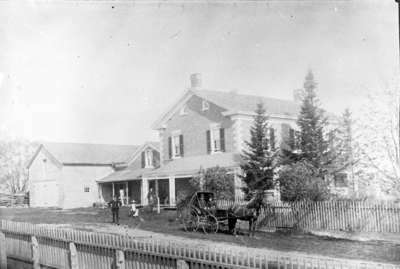 Black and white negative depicting a photograph of the Bradley-Coakwell residence. There is a horse and carriage in the foreground at right. People can be seen on the front lawn. The house has a large veranda. This brick house was built for John Bradley in 1864. It was located on lot 25 of Concession 5 in Whitby Township. The house was later owned by Thomas Coakwell and William Franklin Batty. The veranda around the house was destroyed by Hurricane Hazel in October 1954. The house was demolished in 2013 for the 407 highway expansion. Bradley-Coakwell-Batty Residence, c.1885, Photographer Unknown. Whitby Archives 28-000-004.